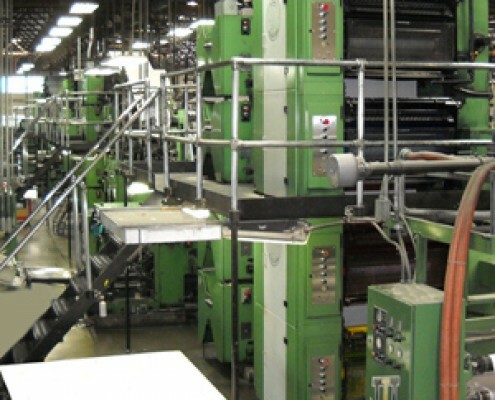 Our Dev and Global presses have sixteen perfecting units each, with DEV/Global folders, each configured with three 4 color towers, a 2 high tower for spot color, 2 mono units and zero speed splicers. 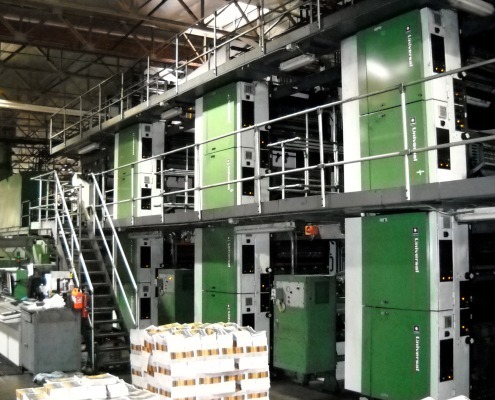 The presses are capable of speeds of up to 30,000 impressions per hour, producing outstanding back-to-back four color registration. Both presses are also configured for in-line publication binding and trimming. Our Universal press has sixteen perfecting units running bearer to bearer. Custom, configured with Butler zero speed splicers and Ebway fan out rollers, Butler infeeds and QuadTech web guides, Support Systems bustle wheels, Quad Tec cuttoff controls and Quad Tech RGS color register systems compliment the press allowing incredible color registration and control.